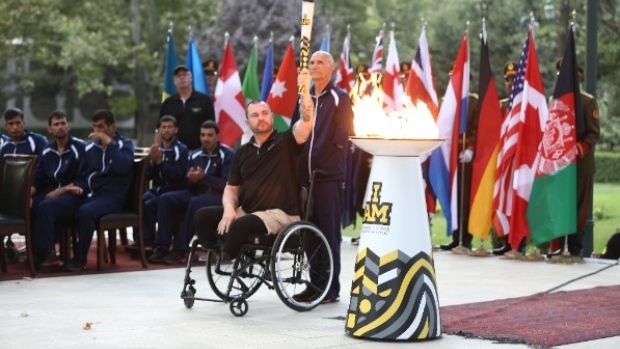 The road to the 2017 Invictus Games in Toronto took another memorable step on Wednesday as the Invictus Spirit Flame was lit during a moving ceremony at the Afghanistan Presidential Palace in Kabul. The flame will travel to the Landstuhl Regional Medical Centre in Germany later this month before heading to Canada to light the cauldron at the Opening Ceremony, symbolizing the journey of many service members from the battlefield to the Invictus Games – and from injury to recovery. Its journey will culminate at the Invictus Games Opening Ceremony at Toronto's Air Canada Centre on September 23, where it will be carried onto the stage by a Canadian competitor accompanied by family. They will then light the 'I AM' cauldron, marking the start of the Games. "Many Invictus Games competitors served and became ill or injured in Afghanistan," said Invictus Games Toronto CEO Michael Burns. "In fact, 14 of the 17 nations participating in the 2017 Invictus Games had service personnel killed or injured there. "Afghanistan is now also indelibly woven into the national fabric of Canadian military history. It is fitting that the Invictus Spirit Flame be lit in Kabul." Afghan President Ashraf Ghani and Gen. John Nicholson, commander of the NATO-led Resolute Support Mission, attended the ceremony along with the Afghan team for the Invictus Games and various Afghan officials, representatives and participants. "In order to stand here in freedom, thousands have lost their lives. Freedom is a product of this collective sacrifice." said President Ghani. "There is a bond of blood between our soldiers and our peoples, in a cause they have considered to be greater than themselves: it is for the safety of generations to come, and of the world. "Invictus represents the triumph of will over adversity." The flame, which represents the wounded warriors' spirit still burning bright, was passed to retired MCpl. Jody Mitic, a 20-year Canadian veteran and official ambassador of the 2017 Games. Mitic was on his third tour overseas in Afghanistan when he lost both his feet after stepping on a landmine. "It makes sense that the Invictus Spirit Flame would be lit in Kabul," he said. "After all, this is where the lives of so many Canadian soldiers changed dramatically. "To be a part of an initiative that would provide such vivid context to the realities of service and sacrifice endured by our servicemen and women was an opportunity I could not refuse." It will Canada's first time hosting the Invictus Games, which were founded in 2014 by Prince Harry of Wales. There will be 550 competitors from 17 countries coming to Toronto to compete in 12 sports, including track and field, swimming and golf. The Games will take place from September 23 to September 30 and will be broadcast on TSN and CTV.